Survivor and witness of the May 19, 1836 Comanche raid on Fort Parker. Adopted by the Comanches after the raid on Fort Parker. Lived as a member of the Comanche tribe for 24 years. 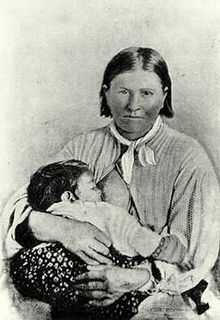 Cynthia Ann Parker (October 28, 1827 – March 1871), also known as Naduah (Comanche: Narua), was an Anglo-American who was kidnapped in 1836, around age 10, by a Comanche war band which had attacked her family's settlement in defense of their land. Her Comanche name means "someone found." Parker was adopted by the Comanche and lived with them for 24 years, completely forgetting her white ways. She married a Comanche chieftain, Peta Nocona, and had three children with him, including the last free Comanche chief, Quanah Parker. At approximately age 34, Parker was discovered and forcibly relocated by the Texas Rangers, but spent the remaining 10 years of her life refusing to adjust to life in white society. At least once, she escaped and tried to return to her Comanche family and children, but was again brought back to Texas. She found it difficult to understand her iconic status to the nation, which saw her as having been redeemed from the Comanches. Heartbroken over the loss of her family, she stopped eating and died of influenza in 1871. Cynthia was born to Silas Mercer Parker and Lucinda Parker (née Duty) in Crawford County, Illinois. Her birth date is uncertain; according to the 1870 census of Anderson County, Texas, she was born in 1824 or 1825. Originally, her middle name was Ana, but over the years, her name was changed to Ann. When she was nine or 10 years old, her grandfather, John Parker, was recruited to settle his family in north-central Texas; he was to establish a settlement fortified against Comanche raids, which had been devastating to the Euro-American colonization of Texas and northern Mexico. The Parker family, its extended kin, and surrounding families established fortified blockhouses and a central citadel—later called Fort Parker—on the headwaters of the Navasota River in what is now Limestone County. John Parker, the patriarch of the family, had experience negotiating with various Indian nations going back to the 18th century, when he was a noted ranger, scout, Indian fighter, and soldier for the United States. Historians conjecture that when he negotiated treaties with the local non-Comanche Indians, he believed those treaties would bind all Native Americans. If so, this was a tragic mistake. On May 19, 1836, a force of anywhere from 100 to 600 Indian warriors, composed of Comanches accompanied by Kiowa and Kichai allies, attacked the community. John Parker and his men, who lacked sufficient knowledge of the Comanches' military prowess, were caught in the open and unprepared for the ferocity and speed of the Indian warriors. They managed to fight a rearguard action to protect some of the escaping women and children, but soon all of the settlers retreated into the fort. The Indians attacked the fort and quickly overpowered the outnumbered defenders. Cynthia and five other captives were led away into Comanche territory. The Texans quickly mounted a rescue force. During the Texans' pursuit of the Indians, one of the captives, a young teenage girl, escaped. All of the other captives were released over a period of years as ransom was paid, but Cynthia remained with the Indians for nearly twenty-five years. She may have been as young as 8, or just older than 11, when she was captured. Cynthia was soon integrated into the tribe. She was adopted by a Tenowish Comanche couple, who raised her as their own daughter. She forgot her original ways and became Comanche in every sense. She married Peta Nocona, a chieftain. They enjoyed a happy marriage, and as a tribute to his great affection to her, he never took another wife, although it was traditional for chieftains to have several wives. They had three children, famed Comanche chief, Quanah, another son named Pecos (Pecan), and a daughter named Topʉsana (Prairie Flower). In December 1860, after years of searching at the behest of Cynthia's father and various scouts, Texas Rangers led by Lawrence Sullivan Ross discovered a band of Comanche, deep in the heart of Comancheria, that was rumored to hold American captives. In a surprise raid, the small band of Rangers attacked a group of Comanches in the Battle of Pease River. After limited fighting, the Comanche attempted to flee. Ranger Ross and several of his men pursued the man who had appeared as the leader, and who was fleeing alongside a woman rider. As Ross and his men neared, she held a child over her head. The men did not shoot, but instead surrounded and stopped her. Ross continued to follow the chief, eventually shooting him three times. Although he fell off his horse, he was still alive and refused to surrender. Ross's cook, Antonio Martinez identified the man as Nocona and murdered him. The Rangers began questioning the woman fleeing with Nocona and other surviving Comanche. In broken English, she identified herself and her family name. Her information matched what Ross knew of the 1836 Fort Parker Massacre. There is some question whether the man killed was actually Nocona. Cynthia stated that he was her personal servant, a Mexican slave named José Nakoni. [unreliable source?] Quanah Parker refused to correct the story of his father's death. According to his daughter, Nelda Parker Birdsong, Quanah is reported to have said, "out of respect to the family of General Ross, do not deny that he killed Peta Nakona. If it is any credit to him to have killed my father, let his people continue to believe that he did so." Ross sent her and her child to Camp Cooper and then notified her uncle, Colonel Isaac Parker. When Colonel Parker mentioned that his niece's name was Cynthia, she slapped her chest and said, "Me Cincee Ann." He took her to his home near Birdville. Cynthia's return to her birth family captured the country's imagination. 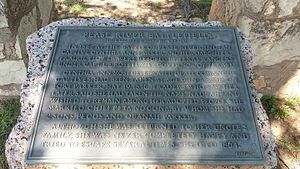 In 1861, the Texas legislature granted her a league (about 4,400 acres) of land and an annual pension of $100 for the next five years, and made her cousins, Isaac Duke Parker and Benjamin F. Parker, her legal guardians. Cynthia never adjusted to her new surroundings, and although white and physically integrated into the community, she was uncomfortable with the attention she received. Her brother, Silas Jr., was appointed her guardian in 1862, and took her to his home in Van Zandt County. When he entered the Confederate Army, she went to live with her sister, Orlena Parker O'Quinn. According to some, the cause of her unhappiness was that she missed her sons and worried about them. Writing in the Crowell Index on October 8, 1909, Tom Champion opined, "I am convinced that the white people did more harm by keeping her away from them than the Indians did by taking her at first." There is some confusion about Cynthia's actual birth and death dates. Different sources place her birth from 1825 to 1827 in Coles, Clark, or Crawford counties of Illinois, and her death from 1864 to 1871 in Anderson County. The only record of her death, given as March 1871, is found in the unpublished notebook of Susan Parker St. John. The only known document from the period supports the March 1871 date; An 1870 census for Anderson County lists her as a member of the O'Quinn household, born "abt 1825," age forty-five. 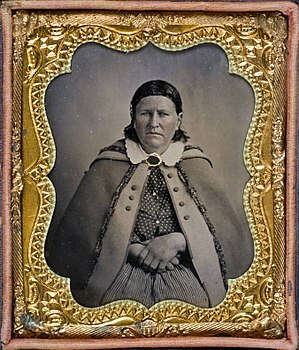 The city of Crowell, Texas, has held a Cynthia Ann Parker Festival to honor her memory. The town of Groesbeck holds an annual Christmas Festival at the site of old Fort Parker every December. It has been rebuilt on the original site to exact specifications. Over time, Cynthia's story has been told from multiple historical and cultural perspectives. One of the most recent long-form explorations is Texas Tech University history professor emeritus Paul H. Carlson's 2012 book, Myth, Memory, and Massacre: The Pease River Capture of Cynthia Ann Parker. An elementary school in Houston, Texas, is named for Cynthia. Cynthia Parker (c. 1939) is a one-act opera composed by Julia Smith. The 1954 novel The Searchers, by Alan Le May, is loosely based on Cynthia's life story. The 1956 movie The Searchers was based on Le May's novel, directed by John Ford, and featured John Wayne as an obsessed frontiersman searching for years for his kidnapped niece. Natalie Wood and her younger sister, Lana Wood, portray the kidnapped woman at different ages. In the 1957 book The Hanging Tree, a collection of short stories by Western writer Dorothy M. Johnson, the story "Lost Sister" is a fictionalized account of Cynthia's relocation and her difficulty assimilating back into non-Native culture. The 1979 graphic novel Comanche Moon by Jaxon depicts Cynthia's story from her adoption by the Comanches through the life and death of her son, Quanah. Ride the Wind (1982) by Lucia St. Clair Robson is a fictionalized account of Cynthia's capture and life among the Comanches. Season of Yellow Leaf (1983) by Douglas C. Jones is a fictionalized story of Cynthia's life. Gone the Dreams and Dancing (1984), also by Jones, is a fictionalized story of Cynthia's son, Quanah, after he surrendered at Fort Sill, Oklahoma, and "walked the white man's road." The character "Stands With A Fist" in the 1990 movie Dances With Wolves is based on Cynthia. Where the Broken Heart Still Beats (1992) by Carolyn Meyer is a fictionalized account of Cynthia's return to her birth family. The Dutch writer Arthur Japin wrote a book, De overgave (2007), about the life of the Parker family and the loss of Cynthia. ^ a b c d Schmidt Hacker, Margaret: Cynthia Ann Parker from the Handbook of Texas Online (November 3, 2011). Retrieved January 14, 2015. 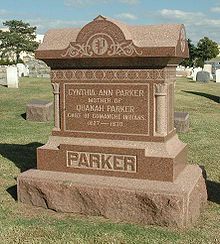 ^ a b c "Find a grave: Cynthia Ann Parker". ^ a b c Frankel 2013, pp. 86–87. ^ Taa Nʉmʉ Tekwapʉ?ha Tʉboopʉ (Our Comanche Dictionary). 2010 revision. Elgin, Oklahoma: Comanche Language and Cultural Preservation Committee. It is an anglicized form of the actual Comanche construction na-uhru, literally 'was found'. ^ "PARKER, CYNTHIA ANN". tshaonline.org. Texas State Historical Society. 2010-06-15. Retrieved 11 September 2017. ^ Morritt, Robert (2011). The Lure of Texas. UK: Cambridge Scholars Publishing. p. 358. ISBN 978-1-4438-2713-3. Retrieved 11 September 2017. ^ Gwynne 2010, p. 15. 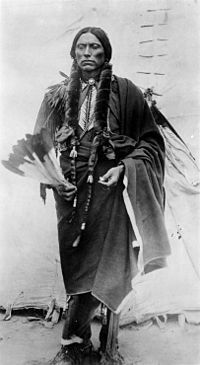 ^ Hosmer, Brian C.: Quanah Parker from the Handbook of Texas Online (June 15, 2010). Retrieved January 14, 2015. ^ Benner 1983, p. 54. ^ a b Benner 1983, p. 57. ^ a b Muncrief, Dennis (January 2004). "The Story of Cynthia Ann Parker". Rootsweb. Retrieved April 16, 2013. ^ Davis, Charles G.: Camp Cooper, Texas from the Handbook of Texas Online (February 5, 2011). Retrieved January 14, 2015. ^ Selden, Jack K. Jr.: Isaac Parker from the Handbook of Texas Online (June 15, 2010). Retrieved January 14, 2015. ^ Hart, Brian: Birdville, Texas from the Handbook of Texas Online (June 12, 2010). Retrieved January 14, 2015. ^ Hesler, Samuel B.: Parker, Benjamin F. from the Handbook of Texas Online (June 15, 2010). Retrieved January 14, 2015. ^ "United States Census, 1870," database with images, FamilySearch(https://familysearch.org/ark:/61903/1:1:MXGV-SBB : accessed 2 June 2016), Cynthia Parker in household of Jas R Ophimo, Texas, United States; citing p. 212, family 1521, NARA microfilm publication M593 (Washington D.C.: National Archives and Records Administration, n.d.); FHL microfilm 553,072. ^ Exley 2001, p. 176. ^ a b Frankel 2013, pp. 86. ^ "School Information / Overview". Houston Independent School District. ^ Hoberman, J. (February 22, 2013). "American Obsession: 'The Searchers,' by Glenn Frankel". The New York Times. Retrieved February 22, 2013. ^ McBride 2001, p. 552. ^ Aleiss, Angela (2005). Making the White Man's Indian: Native Americans and Hollywood Movies. p. 145. ISBN 9780275983963. This page was last edited on 7 March 2019, at 19:05 (UTC).